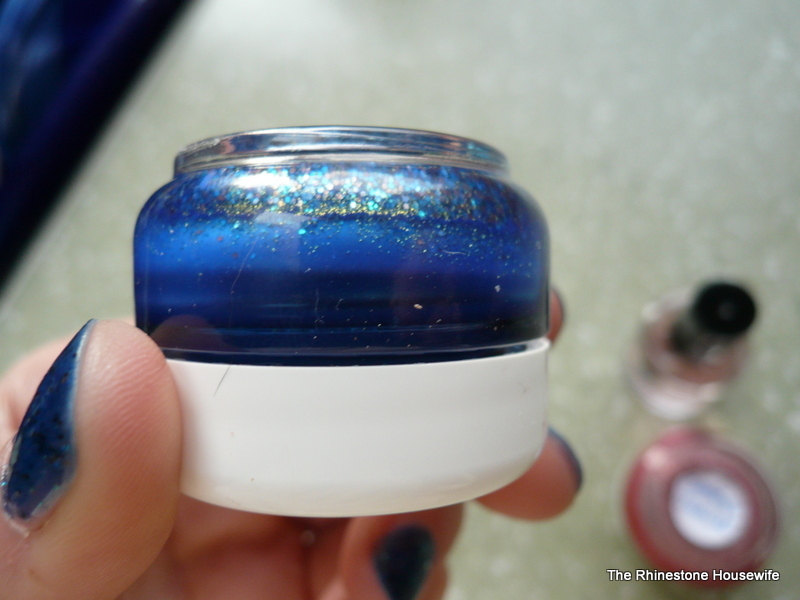 Last week I bought a couple of jars of nail polish from Etsy. The colors looked super amazingly glittery and pretty and very lush. 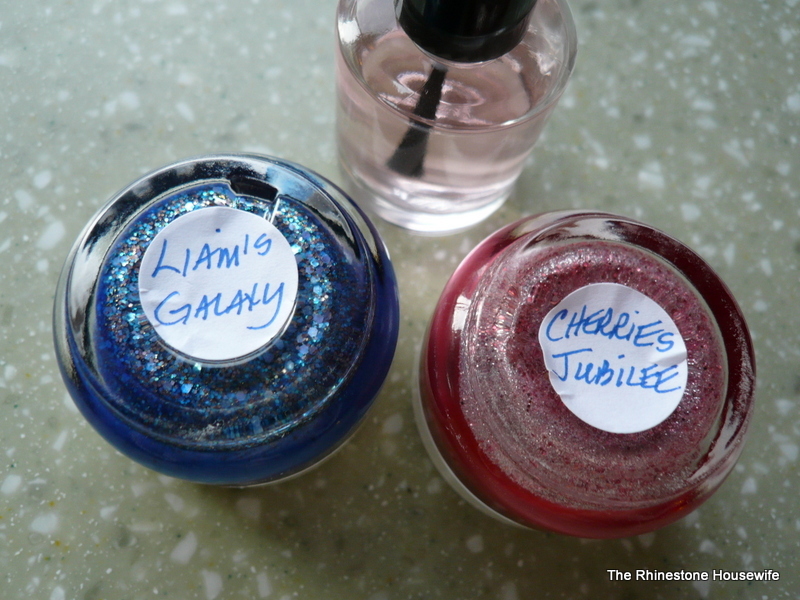 I bought two polishes from Wonder Beauty Products, Liam’s Galaxy and Cherries Jubilee. The shipping was very fast as I ordered on 3/28/12 and received my order on 4/3/12. Everything was packaged nicely with no spills or messes. Along with the jar of polish I also received a stirring stick, and a top coat of sorts which were all wrapped up in an organza bag. Immediately that night I whipped out Cherries Jubilee and got ready to do some nails. The first thing I did was watch the YouTube tutorial. The tutorial didn’t actually show you how to use the product, it basically just talked about how wonderful the products were and explained the components of the kit that you’d receive. Hmmmm. I decided to give it a whirl and messy madness ensued! 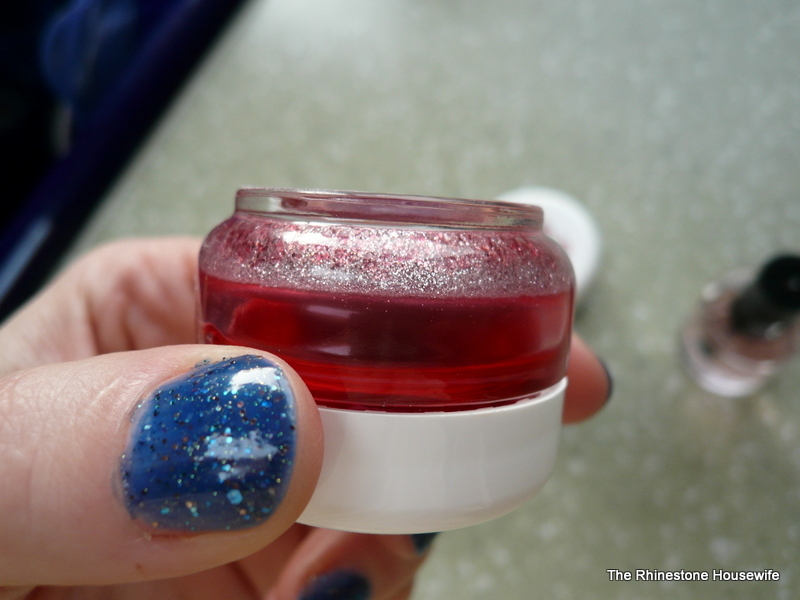 In order to use these polishes you have to stir the jar with the little stick provided, then quickly dip the brush from the clear coat into the colored glitter polish and apply. I found you had to do this with each nail you polished and it was messy and time consuming for sure. 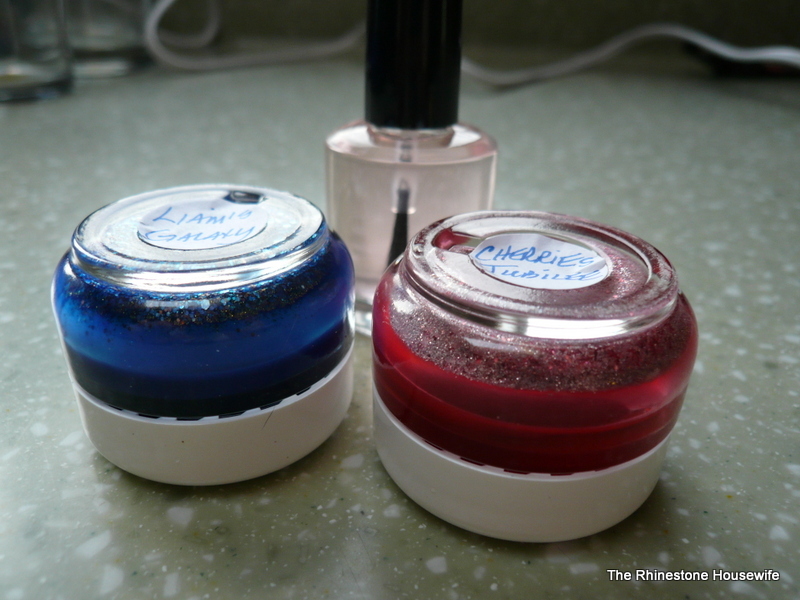 I hadn’t applied a base coat and only did two coats of the Cherries Jubilee. Because it was so lumpy I applied two coats of the clear polish provided and found it not to be very shiny at all. After my less than stellar experience using the product I went and checked the etsy feedback for Wonder Beauty Products and found a few neutral reviews that were similar to mine. Basically the same issues, colors not the same, hard to use, difficulty getting opaque color etc. The reviews were fair and I was vindicated in my difficulty in using the products…..I wasn’t totally inept! Ha! 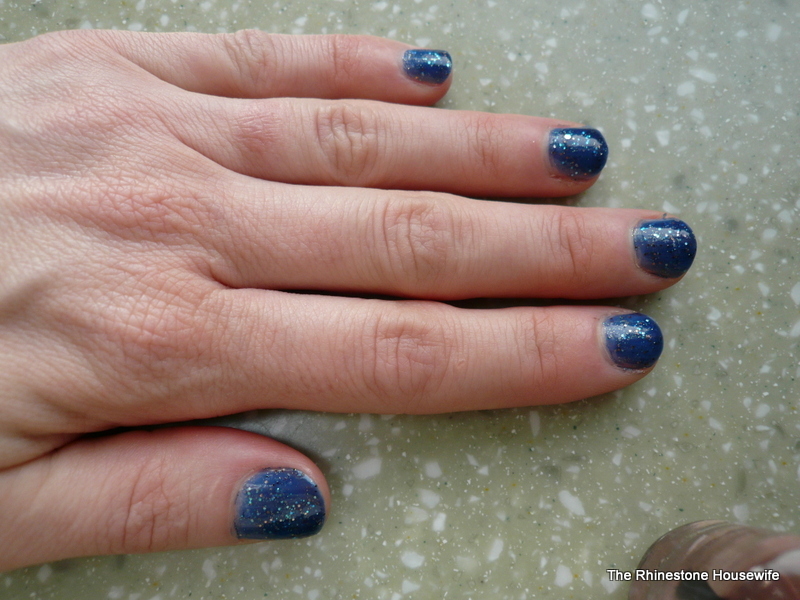 Yesterday I decided to try the next color, Liam’s Galaxy. 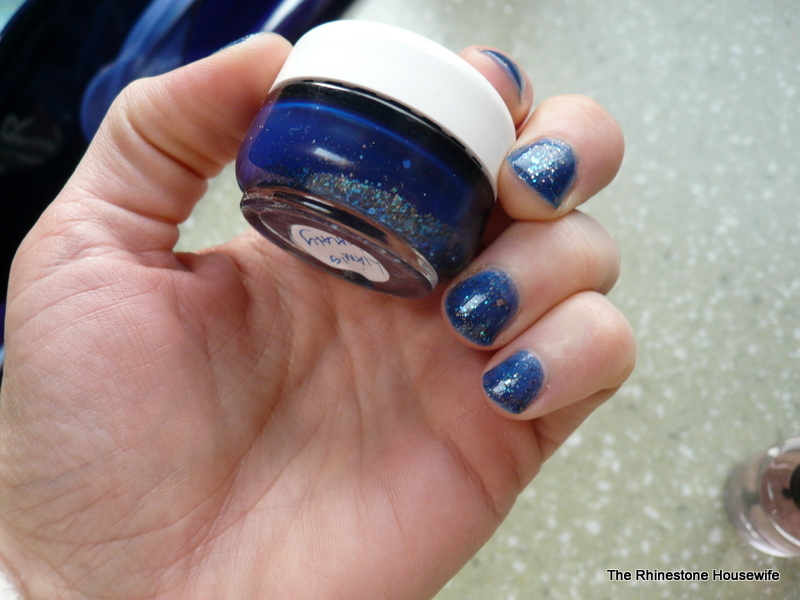 I went back to Etsy to check the feedback I’d seen about this polish and I couldn’t find it. WTF? I know I’d read a neutral feedback about how it wasn’t the same color at all and didn’t look like the photos and was difficult to use but now I couldn’t find that feedback. Hmmmmmm. I got to work on my nails but this time I used Seche Vite base coat, three coats of the actual color and Seche Vite top coat. The results were marginally better but still nothing like the photos. The blue color is completely different than the photos and much darker in person. I’m pretty sure that I’d never purchase any more of these polishes but I’m willing to give them a couple more shots and see if I can get the application down. The part that really bothers me is the disappearing feedback. Where did it go? I KNOW I read it as I remember specifically some of the issues the buyer had. I chose not to leave negative feedback as I hadn’t contacted the seller at all about the issues I’d had. I guess I could have gotten my money back but in light of the disappearing feedback I decided to leave neutral but honest feedback. Apparently the seller was not happy and in turn left me slightly snarky feedback. I thought it would be more useful for people to be able to read the feedback. My experience wasn’t negative per se, the customer service and shipping were great. I just felt the product didn’t meet expectations. 4/9/12 6:54pm Edited to add that the seller has offered me a full refund in which both of our neutral feedback will be removed and I have accepted. Sellers who leave snarky feedback in response to an honest account of the products they purchased are downright unprofessional in my opinion. No one should eb afriad of retalitory feedback by leaving a truthful account of their experience, ecspecially if they ahve conatcted the seller first to voice their concerns. Great product review! I love how detailed you are when going over your experience with the product! Veyr helpful. Yes, I thought it was unprofessional but I also didn’t contact here before I left the feedback. I’m wondering where the heck the other neutral feedback went. There were like three neutrals and one negative and I only see one neutral now, and then mine. Weird. I thought my feedback was fair (and NOT negative, I gave a neutral) but I guess she’s mad because I didn’t contact her. One of the neutral feedbacks That disappeared was mine. She is sending me a new Liam’s Galaxy and we did the “kiss and make up” process. She left me snarky neutral buyer feedback as well, which is why I agreed to the kiss and make up. I also did not contact her before leaving the neutral feedback. I was the one who said the color was nothing like the picture and the glitter was difficult to get out. Oh well, you win some, you lose some. We’ll see if the new one she sends is any better. Ok, so that’s good to know! Thank you for commenting. Does the feedback disappear because the listing/sale was deleted or do you have to remove it? Let me know how you like the new formula, I’d enjoy to hear what you think of it. Wow, it’s like clockwork…she just sent me a message offering a full refund and we can both change our feedbacks to positive. The reviews disappear after the kiss and make up process is finalized. I will definitely update you when I get my new jar. I’m hoping the color is closer to the picture this time! Any updates on the new jar?